As I was flipping through the March issue of Allure (to be honest…I was procrastinating, LOL! ), this beautiful picture stopped me in my tracks. The woman’s name is Maye Musk (Elon’s mom), and the caption says she’s a model, muse and truth-teller (hyphenated!). How awesome is this? I mean, it’s a magazine, so I wouldn’t be surprised if there were still some Photoshopping happening, but you can actually see everything — the texture of her skin, her smile lines, the creases between her brows and the beautiful crinkling at the outer corners of her eye. Basically, the markers that decorate the face of someone who’s lived a long life. Let’s get real, when do you ever see pictures of women in big beauty magazines who actually look like they’re getting older? And she’s so totally working it! I love it. P.S. Hiya, friend. How are you? I’m doing better today than I was yesterday afternoon, because yesterday I spent half the day at the dentist’s getting four (!) fillings on my upper right side. On the one hand…my jaw is still a little sore. On the other, I’m happy to report that I didn’t shed a single tear at the dentist’s office. NOT ONE. I was shockingly calm the entire time, which was a first for me. I almost celebrated this victory with an Ulta run afterward because I reeeeeeally want to get L’Oréal Infallible Fresh Wear Foundation, but my stomach started rumbling (the visit took almost three hours). Anyway, miss you. Are you having a good week so far? Have I mentioned that we’re also in the midst of an atmospheric river here, and it’s been pouring FOR DAYS? Previous Post: What Was the Last Beauty Tool You Bought? I love it! I feel like younger women yearn to connect more with the generation of women who have gone before us. although I am inspired by 20-something models I’m more inspired by the women who have gone before me. After all I’m not getting any younger and seeing older women rocking it makes aging myself seem less scary. The website Man Repeller always gets rave reviews when they share content about older women who have lived abundant lives and have stories to tell. Young women in the comments simply live for them. Makeup is for everyone, and every age! I think this is great! 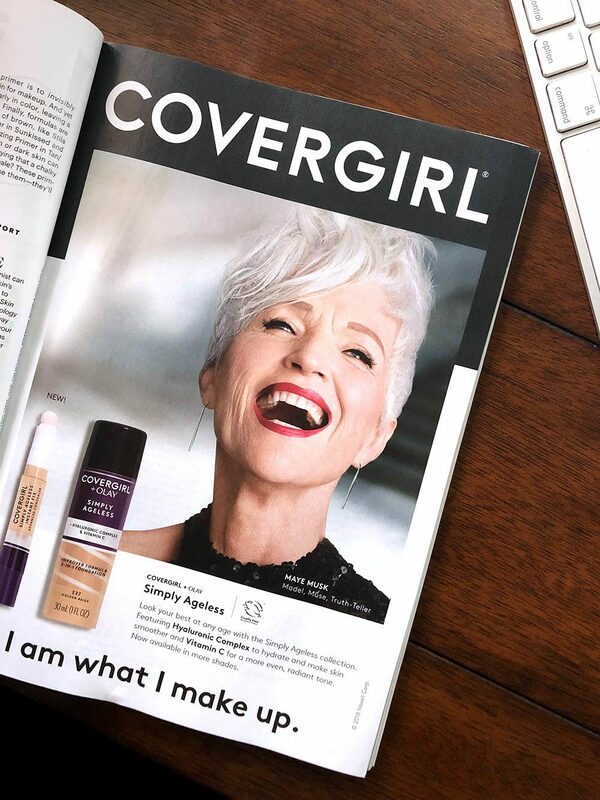 It would be great to see more age ranges in magazines and ads. Glad your dentist appointment went well! The hygienist I always see is a cat lady too so we will chat about our cats and share pics during my appointment. This last week of Feb has just been dragging. So glad we are almost to Friday! Yass. There are others, too: Norma Kamali, Linda Rodin, the Accidental Icon, not to mention all the Hollywood stars that look amazing and are not anywhere near retirement. If it is the one thing that is so feared, vilified, yet INEVITABLE (IF you are lucky!) it is aging. I get fired up when I read “This Chair Rocks” by Ashton Applewhite. Ugh, you should be able to bring Tabs with you to lay in your lap at the dentist. Some dentists allow their golden retrievers to sit on their patients laps during procedures! I’m glad it is over for you for now! As a 49-year-old, I’m thrilled to see this. I would be even more excited if Allure itself had a feature with a model with silver hair. I haven’t been happy with the editorial tone since Linda Wells left. I feel like the entire magazine is devoted to millennials and teenagers. I’ve been reading Allure since I was a young woman myself and I think it was always much more inclusive of all ages than it is now. Actually, Allure had a cover story on Helen Mirren (’17) and Angela Bassett last fall. I am much more interested in what those women have to say about beauty and health than any Jenner. So glad to see this! Hopefully we will see more makeup tutorials on older women as well. Iris Apfel is also one of my inspirations at 97! Hope you’re doing well after the dentist Karen, you are a brave soul! I hate going to the dentist. I finally found the L’Oréal Infallible Fresh Wear Foundation in my color match and snatched it right up. Sorry I did. Definitely not the foundation for me. Full coverage. Matte, matte, matte. Need to work quickly before it sets. Emphasized lines and pores. Made my skinner dryer and dryer and dryer as the day wore on, until I was actually flakey when I went to take it off. Might give it one more try with a boatload of moisturizer under it. If I can’t get it to work it’s going in the bin. I think it probably works best on folks with oily skin. Or maybe normal skin that has perfectly smooth texture. I do have this Allure and thought about this woman’s picture . Her hair her features her wrinkles . I wondered how old she might me . She really is beautiful. And brave . To be pictured in Allure when everyone else either has a face lift or tons of make up . I wondered if I could be that brave ! Loreal fresh wear ! Love, love ,love ! So awesome! I love her hair and her smile. I was home sick today with sinus crud, and I took pseudoephedrine, which I regret because it makes my chest hurt (heart condition). I’ll have to switch to a nasal spray or something. But otherwise things are okay. I have a dentist appointment later in March but I’m really looking forward to my haircut next week, my hair is a mess. I also have a physical next week, which is good because I need to tweak my birth control. Whatcha thinking about doing with your hair? I desperately need to address mine, too. I’ll probably my just clean it up! I have a center part and subtle long layers but I probably need an inch gone. Allure are the ones that banned the term anti-aging from their magazine, so that feels like the natural next step. Beautiful! Oh, my gosh! I’m so sorry for you. Great job on toughing it out. I know how you feel about the dentist. 🙁 It’s terrific to see more “real” people in magazines. Let’s hope it’s a trend!